So, when we checked in, it was 55 degrees. When we checked out the next morning, the temp was already in the 80s. What a difference a storm makes. 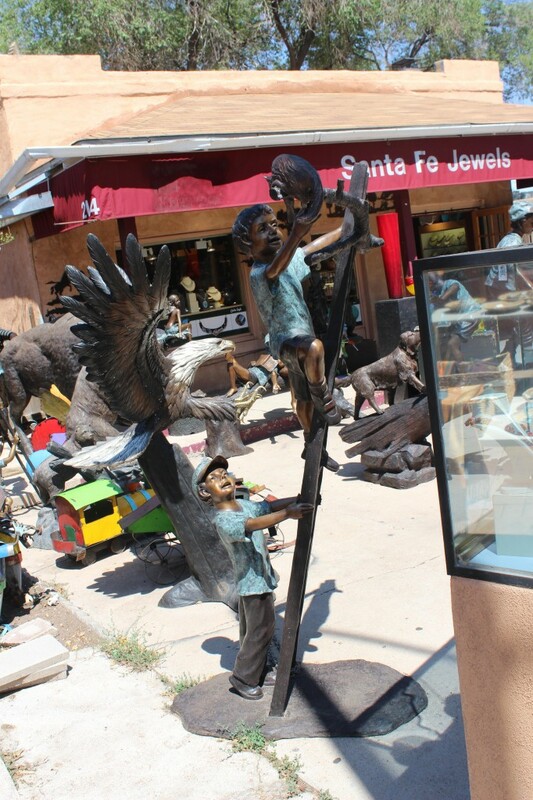 Santa Fe has been known for quite a while as an artsy town. So we went downtown to see what all the fuss was about. The downtown square has many shops that sell many things. This first shop I really like. Can you guess why? Don’t know? How about this one? Ok .. one last one .. and then I’ll tell. 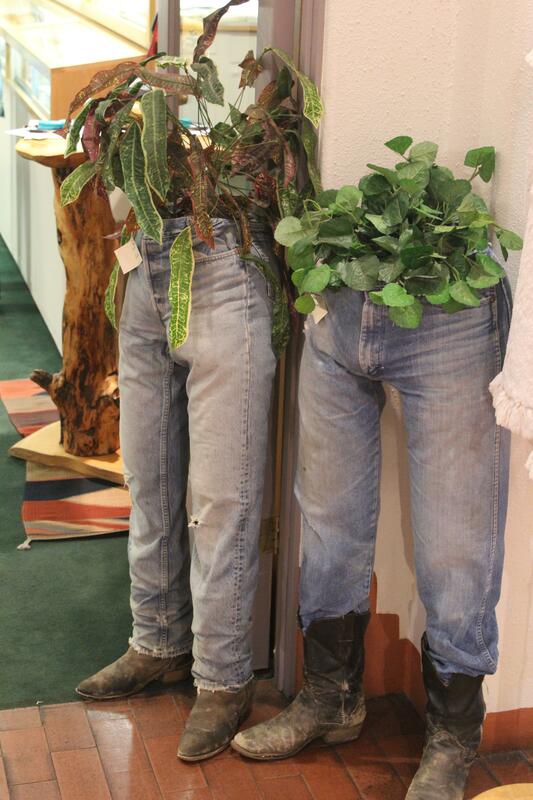 These sculptures don’t remind you of anything? Well .. maybe something you might have seen on the cover of The Saturday Evening Post? These pieces of work remind me of what Normal Rockwell would have painted. Anyway, they reminded me of that. How about a bear trying to get honey? No .. not Winnie the Pooh. And what do bears like to do when they’ve finished all their honey? 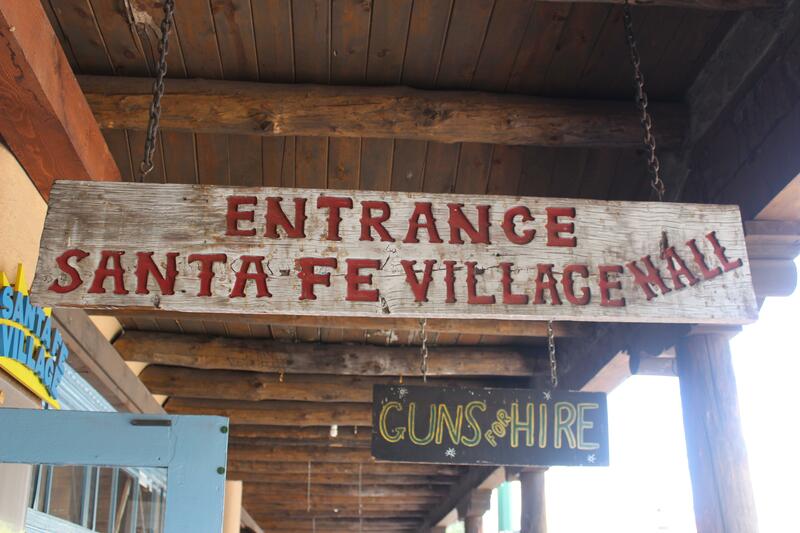 Santa Fe even has a downtown mall. Around the corner, you can even play checkers. Notice the pieces. If you can’t tell what the pieces are, they are bottle caps. Put them upside down or right side up and you have a game. Now, someone is going to have to explain the next one to me. What’s a trip to the southwest without some chiles? 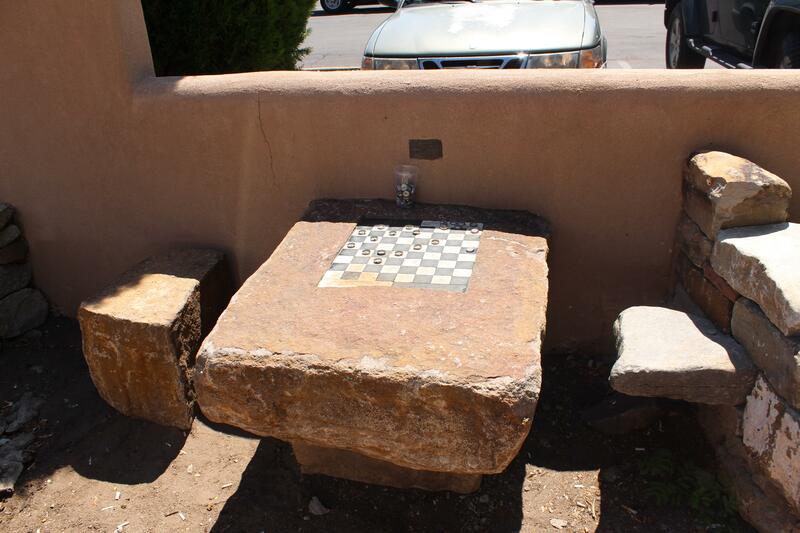 This was outside the Little Burro Cafe. And no party is complete without one of these. 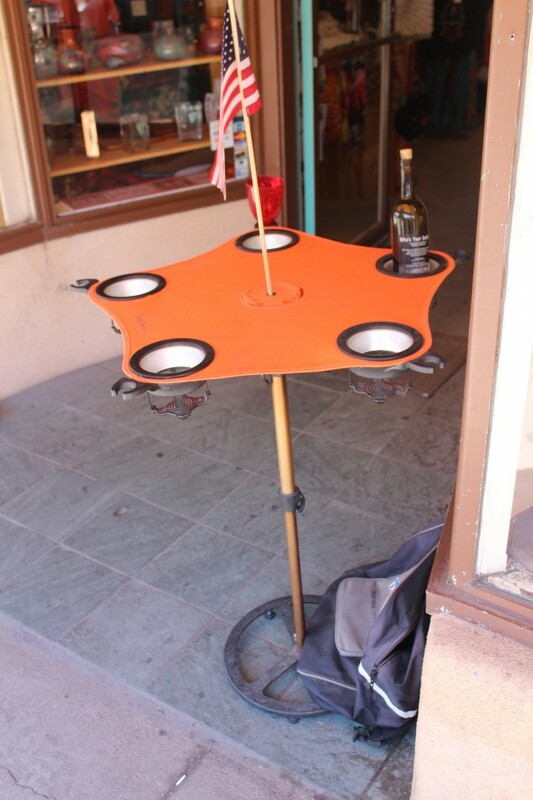 A portable drink table. There is not much to see between Santa Fe and Albuquerque. As we were coming down the hill into Albuquerque, Trevor noticed something off in the distance. Maybe you’ve heard about it on the news. Not so much to see today. 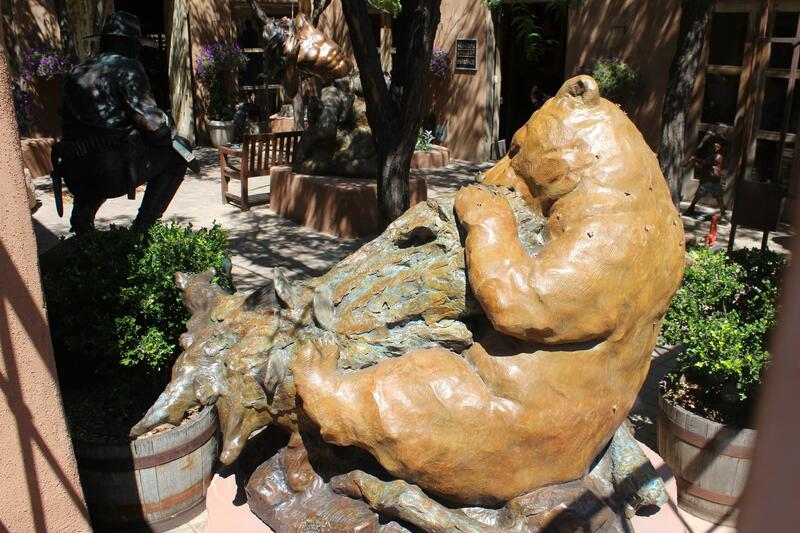 I have a few more shots in Santa Fe that I didn’t post here. 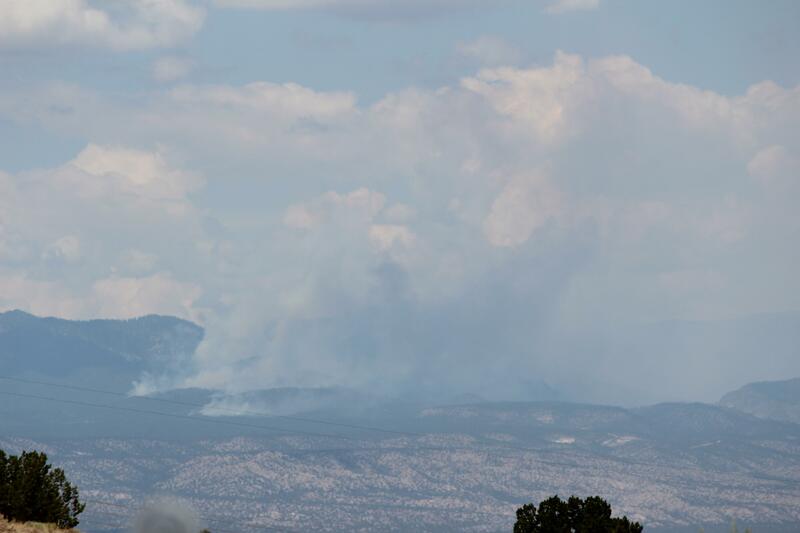 Next, we’re off to Galup, NM. See you then. I too liked the art of the young children playing. It looked very innocent and peaceful. Ah, so many memories, so little time! 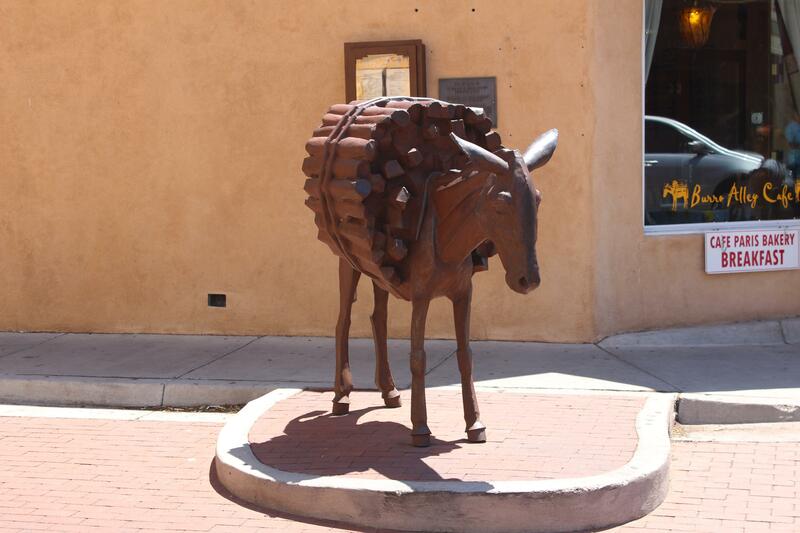 I loved seeing Santa Fe with you! I never actually got that far upstate, because I get altitude sickness, and for me that complementary oxygen would have been necessary, as the air is thin up there! 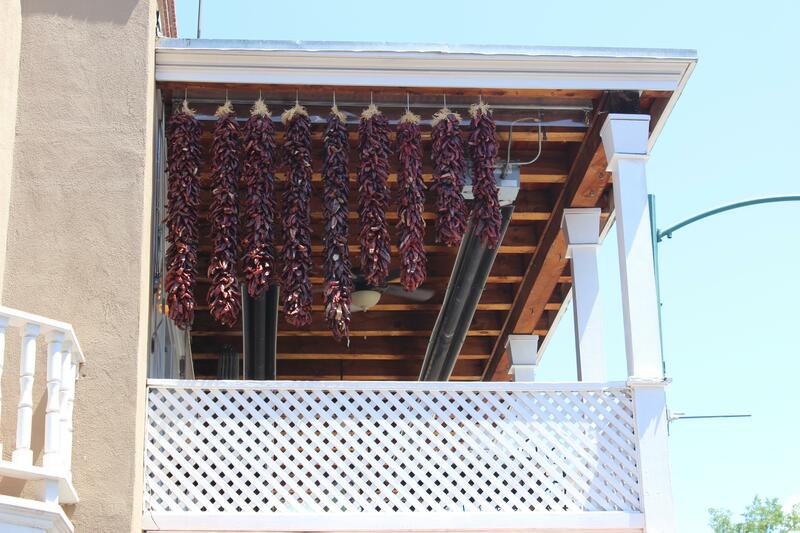 The hanging chillies are a common sight in New Mexico! During the chilli harvest, you see vendors outside of shopping areas, roasting chillies while you wait, and I guess you take them home and freeze them for use all year long! 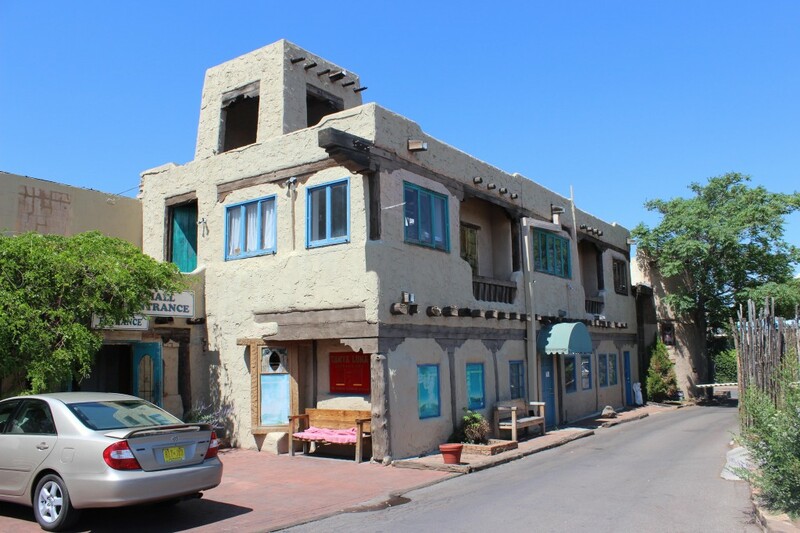 The chillies are featured in just about anything you eat in New Mexico, and there is some fine eating to be found if you like Mexican fare! 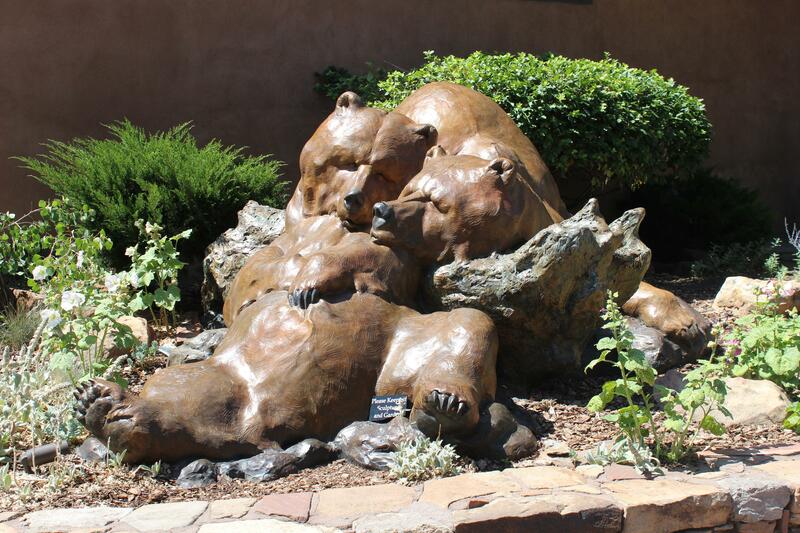 I also enjoyed seeing the sculptures! Very nice! What caught my eye in the first shot, tho, was the word “Jewels” for as you know, I am a sucker for anything sparkly! LOL! Connie, no need to freeze chiles if they’ve already been dried. I dried some chiles myself one time and they kept their heat for a few years. I still have a batch. A mall sign advertising guns for hire and mall bench with a blanket on the seat…Blue jean planters… Bottle Cap Checkers… Such interesting things to see. 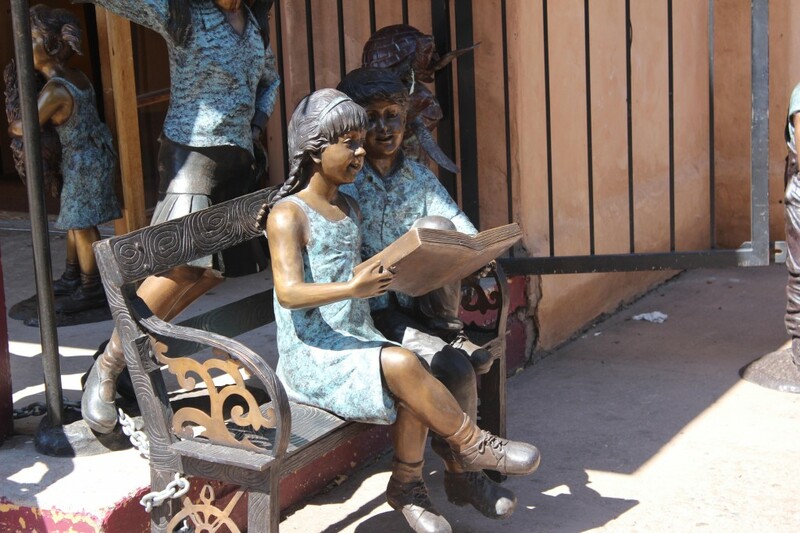 I agree with you about the sculptures being reminiscent of Norman Rockwell’s paintings. 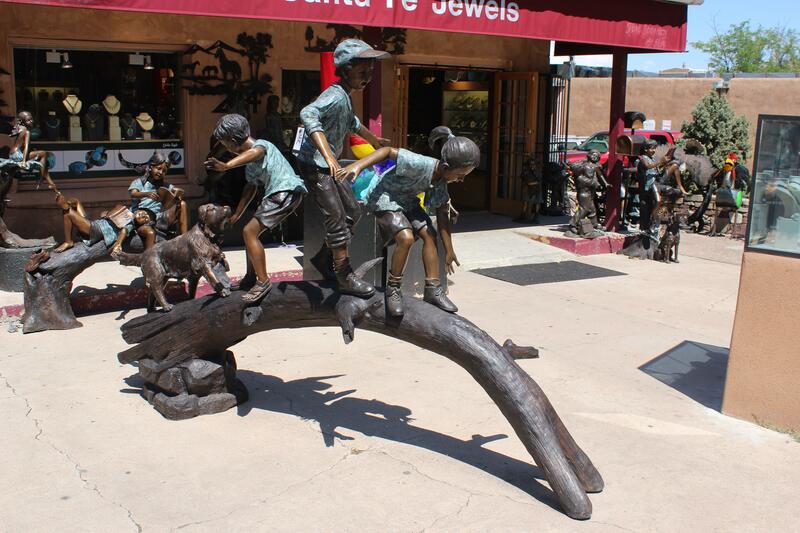 Especially the boy holding up the ladder and the kid’s and dog playing on the arched tree trunk. First I heard of the fire was Trevor’s picture. Loved the sculptures. Excellent hand work and yes, very reminiscent of Norman Rockwell. 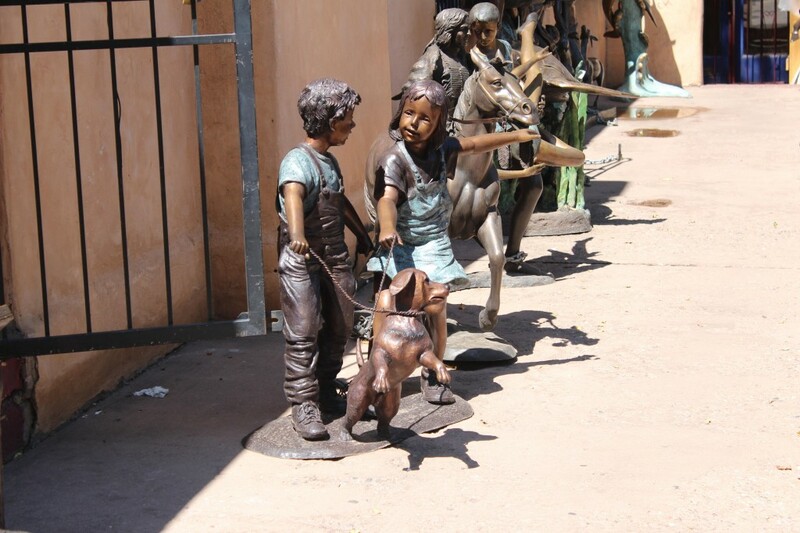 I especially like the color of the kids – tee-hee, yep, my view of Normal Rockwells sculptures. 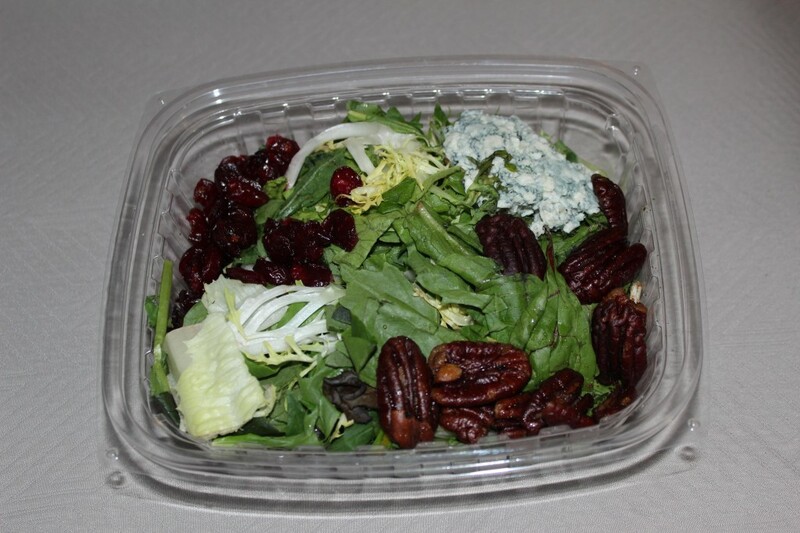 Nice salad, looks good. Are you missing home cooking now? It won’t be long now. 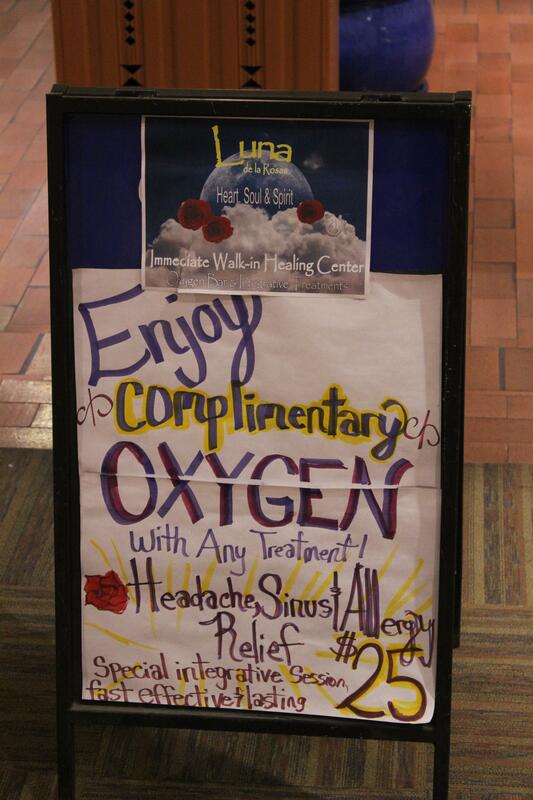 My guess is the complementary oxygen was to enhanse your blood after the session, like the football players do when they are winded and come to the side lines. Like Connie said, you are at a high altitude.